The Apostle Paul had 12 attitudes about the Gospel that brought him as close to the MIND OF CHRIST as anyone could get. When he wrote his letter of encouragement to the Philippian Church, he shared with them those 12 ATTITUDES he had modeled throughout his ministry, as he became an OVERCOMER for Christ. But, Paul’s attitudes were much more than IDEAS or MIND-SETS…they had been ‘lived out’ every day since his conversion…in good times and in challenging times. Honestly, had I personally walked with Paul, he would have had to put me on the bus to home after the first stone was hurled our way. But, Paul just considered each stone, or jail cell, confirmation that he was doing the right thing for Jesus. All too many of us, as Christ-Followers, have been distracted from the ‘Main Thing’ so long that we have lost sight of who we really need to be. 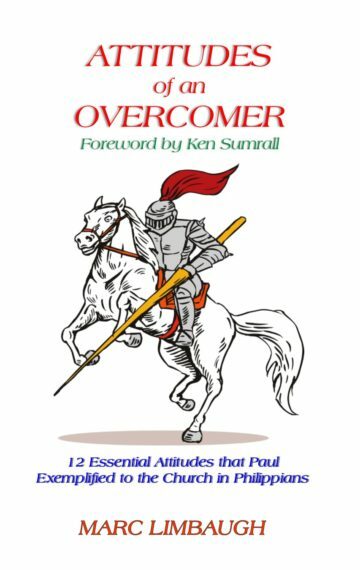 Reading ATTITUDES OF AN OVERCOMER will remind you of the 12 Essential Attitudes we must embrace if we truly want to be OVERCOMERS for Christ. Study each of the 12 attitudes and make a commitment to embrace and practice them until you become an OVERCOMER in your life, your relationships, your neighborhood, your job, your church and in the world. I’m sure PAUL will be cheering you on!